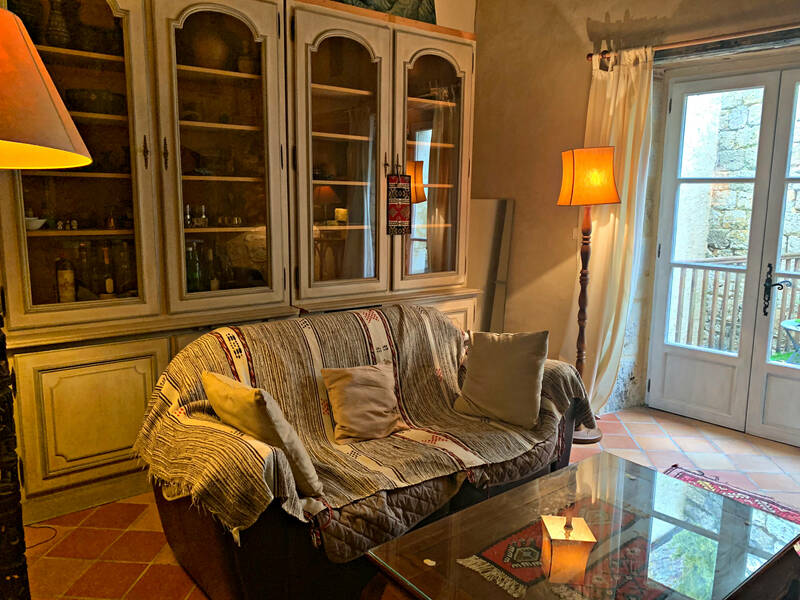 This old stone property sits in a commanding position in the centre of a Gascon village renowned for its gardens and offering a year-round appeal to its residents. A sense of pride is evident in its neatly tended gardens, joyful green and blue shutters, and central village square; a picturesque backdrop to life in rural French village life. The village sits on a ridge facing the valley to each side, offering a glimpse of the mountains to the south, and Lectoure to the north. Entrance to the property is through a side gate, where the eye is drawn immediately to the south-facing gardens, where a riot of flowers and shrubs encircle a beautifully presented pool. The temptation to explore the gardens is too great to resist and the visit to the house is delayed as we follow a small pathway that winds around the pool, to the terrace beyond. This spectacular seating area, is perfect for entertaining, or contemplating the view, and is suspended high above the neighbouring rooftops and gardens lending the impression that one is sailing towards the Pyrenees on the prow of a boat. There is a magic here which is undeniably one of the main features of this property. Utterly private this space offers all the tranquillity of a country house yet in the heart of a village. The neighbouring properties on the western side, offer a sense of security, viewed from afar. The neighbouring houses are lived in all year round, a comfort for prospective buyers nervous about the purchase of a more isolated property, yet here, on the terrace face to face with the views, it is as if we are alone, with the tableau of the Gascon countryside spread before us throughout the seasons. On the terrace by the pool, there is an elegant summer room, with a large picture-frame window, providing a perfect entertaining area, in spring and autumn. Entrance to the house is through a small vestibule which leads directly into a reception room with an impressive stone fireplace, housing a wood-burning stove. With windows to each side, light bathes the room, and offers a glimpse of the western gardens which we have yet to explore. The reception room opens onto a spacious kitchen with an elegant central counter supported by pillars in the art deco style. (The temptation is strong to pull up a chair ask for a glass of wine and an aperitif here!) The kitchen equipment is discreetly hidden beneath the counter, yet the space is inclusive, enabling the chef de cuisine to remain with friends and family whilst preparing meals. This is a convivial area for entertaining, with space for a large dining-room table (currently occupied by a grand piano). It is contemporary, quirky, spacious and light, and yet in perfect harmony with the old stone walls. The reception room and the kitchen/dining room offer a splendid open space, which is ideal for a large family, or for entertaining friends and family. French windows open onto a courtyard garden where there is a barbecue area. This is a sheltered spot, perfect for a spot of lunch outdoors, within easy reach of the kitchen. Beyond the kitchen, the property wraps itself around the western gardens, to a spacious study (with an inset wood-burning stove) and a more formal dining-area, with an open fire place. The property benefits from a second staircase, which separates the two wings of the house. The main staircase is located at the entrance to the property and leads to the first floor where there is a grand master bedroom, with a separate dressing room area, a second double bedroom, a separate wc, and large bathroom, with bathtub, single basin and fitted cupboard. From the landing a third wooden stair case which leads to a third bedroom under the eaves. In the guest wing the wooden staircase leads to a bright sunny fourth bedroom, painted in pale blue, providing a superb guestroom, a generous bathroom with a shower, separate wc, and wooden staircase to the fifth bedroom under the eaves. Once two separate village houses in stone, the property was converted into a single residence some twenty years ago, which has resulted in an original layout, where family, children, and guests can live independently on two different sides of the property. This would also enable a very easy division enabling the creation of a separate gite/ chambre d’hôte. There is a laundry-room, which opens onto the front village square, a downstairs garden shower room/wc, a storage area, and a vast garage with a capacity for two cars, and a wood store/workshop. I first sold this house to the owners some eleven years ago- and the countryside is still as utterly unspoilt, the views still as spectacular. My impression on walking in was still the same – turn left at the gate to the views, and you feel you are almost at the tip of the Pyrenees. If you are looking for an original house, which is a far cry from the symmetrical square Gascon house, yet utterly authentic, and full of period features, this property is a must. Here at Bliss we particularly love – the gardens and views! There are perfectly restored stone village houses to be found all over Gascony, but none with views to compare and few offering such a versatile space.